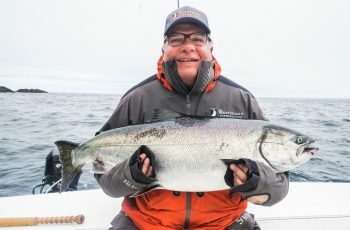 What a nice trip just concluding here at Langara, 12 tyees on the board, 42 lber top fish! 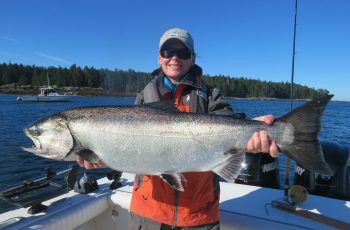 Today saw 5 more tyee, top fish Hugh Kelsey’s 37, and his 33 taken on Predator 2. Bud was deep in Mutton when he found these nice fish, and kept er quiet. Always a nice surprise being greeted on the dock by a huge tote of Kings , so thankful my guests had slipped up top for lunch. I had a dreadful morning, could not get on them. Had a small king at noon and tears welling up in my eyes. Ran my guests to Cape Knox in desperation mode, greeted by stares of what the sam heck you doing here? There were some fish, but not my fishery. Milling around in 180 feet of water praying you hit some feed and win the lottery no good. Some guys do well here, not this guy. Cape Knox is dead to me, over, nice place to visit for a boat ride or to jig some bombers, but that offshore stuff is not the way I like targeting my chinook. In for lunch and back out quickly, had to win my guests back, I had a brutal morning. Out to Lacy, but what the sam heck, nothing! I was feeling concussed, panic setting in, would I have to call on a public radio for help? Yes I did, yes, I did. Jacks at Cohoe, nope, not going there. I can not believe it but back to Knox, what was I thinking? A million boats staring at each other, odd Jack being netted one at a time, now thinking of cyanide tablets. Lasted 30 mins. at Knox, now back to Lacy, it is 5pm, no fish! Baited four rods this time, and thank you fish gods, finally on them, some spring bites. 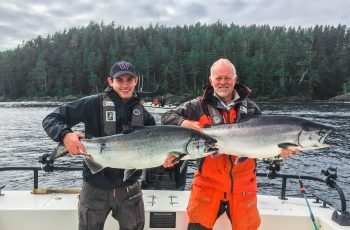 Had a few doubles, grabbed a 30.5 to save the day, and slapped a 20 and a high teener in the boat, trip finished, Ivor Jones had his tyee. What a war it was today for me, but we battled hard and hammered the tar out of the kings for an hour and a half. 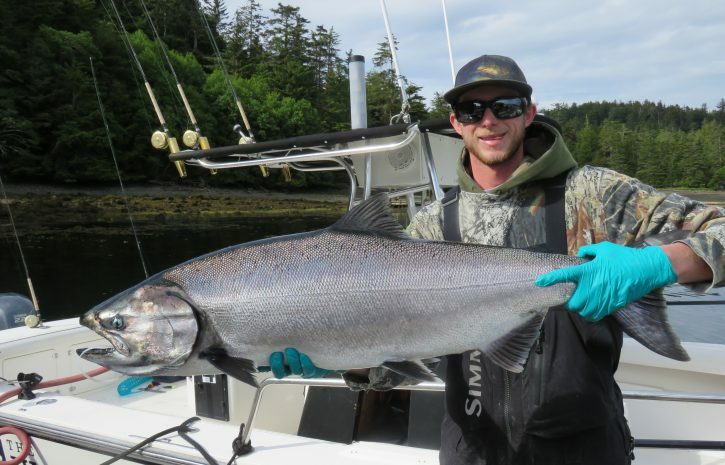 Mark Bemister slipped another 31.5 into his tub, two tyee trip for him. Gord Mcknight snuck a 32.5 in at lunch, nice job. 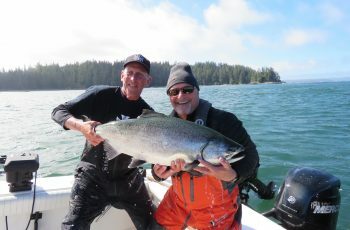 So yes a twelve tyee trip, we are happy again here at the Clubhouse. Weather is nice, see some wind for Friday so better tie the gear down good tomorrow night. 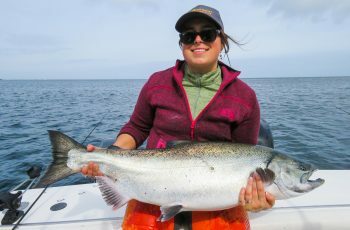 This time of year is so fun, no by catch of smaller salmon such as the pinks, when your rod tip dips it is a chinook, or often a halibut can sneak up on you. Pat sank the gaff into a 35 a half dozen times to get er over the rail this am, what a show! Almost lost Pat, have to get him netting his hali Screamer style.